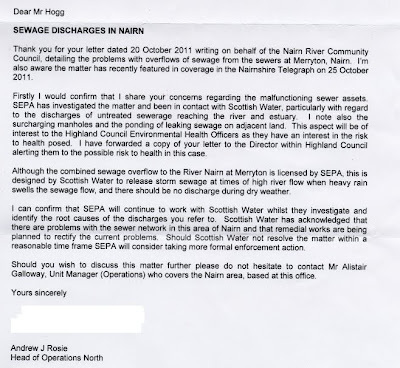 Earlier tonight Tommy Hogg distributed copies of a letter received from SEPA in connection with River CC complaints over the multiple problems in the Sewage/Merryton Bridge area. It looks as though the onus is now very much on Scottish Water to come up with explanations and remedial actions. 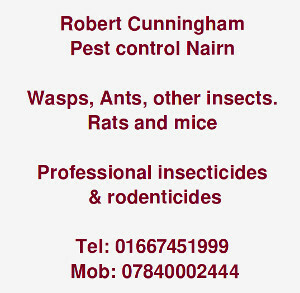 It will be interesting to see what action the Highland Council's Environmental Health Department take. Will you be posting ALL copies of correspondence both verbal and written River CC have, or will there be a selective bias on what's published here? I think Ivor the imaginary reporter will be perhaps putting up anything he considers interesting as it comes into the public domain - just like I do too sometimes from various sources. If you want to know everything - why not go to CC meetings and pay attention as the correspondence items are read out - Normally, I think River, West and Suburban let anyone with an interst read them. Perhaps it would be good for them all to publish everything or most material but it is a question of time and resources. 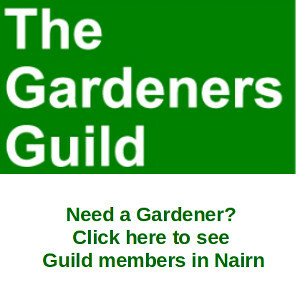 As far as I know none of Nairn's 3 CCs have a website. I understand from an unreliable source that the main cause of fat in our drains is in fact from soap rather than cooking items, so perhaps we are all being too clean or maybe a certain water company don't wash too often! Anyone remember the fat horror vid from the Nairn sewers? Maybe another pull-through down by might help in the short term but the SEPA letter indicates there are serious problems with the network in the sewage bridge area. Keep an eye on it Gurnites, digicam pics and video of anything spilling out would be useful to the cause! It's not a question over CC public visibility. It's a question of whether you will publish all correspondence from your CC on this blog site, or will only selective correspondence be published here? While publishing selective correspondence here from your CC, you may give a biased view of matters. Something which as a responsible member of the CC, I'm sure you'd want to avoid. I am but one member of a CC Anon and the Gurn is not a CC website and the views published here are my own. Newsworthy items get published here as and when their availability and time permit. If you think all CC correspondence should be published online why not go along to a meeting and suggest that - or even offer to do it for the CCs. 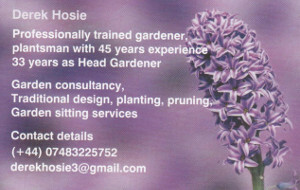 In the meantime as I said CC's in Nairn regularly discuss correspondence and make it available to the public. Unlike Highland Council no Community Councillors receive salaries and they do not have thousands of employees to call upon to assist them in their work. Thus their time and resources are limited. So if you want to know more get to the meetings and pay attention when the correspondence is discussed. It's not a question posed to the CC about their business. The question is as a member of the CC, should you take selective items of their own correspondence, and as a known member of the CC publish that selective correspondence on an independent website. Offering an opinion on an independent website is one thing, but choosing individual items of correspondence from a separate body and publishing selectively, may give a false impression of the actual position. Particularly as your a CC member, publishing your individual views along side only selective correspondence may give the impression your views is of the CC. For your website to remain independent, surely for correspondence its a case of publish all or publish none? Thanks for your views - I don't see a problem with stuff coming on this site when it is in the public domain. If you are a regular reader her you will know that an article was published stating that the CC had also complained on sewage issues to Scottish Water and Highland Council. As was reported at the public meeting the only response so far was from SEPA. Should the Community Council put further correspondence on that issue in the public domain then I will only be too delighted to publish them too. This debate is now closed. Thanks for your opinions. As usual all opinions are my own and not that of any Community Council.